Halloween is around the corner,we need to get ready for it to celebrate the saints, martyrs and faithful who departed. By part-taking, in the celebration, we show honour to our brethren who showed their firmness in their faith. 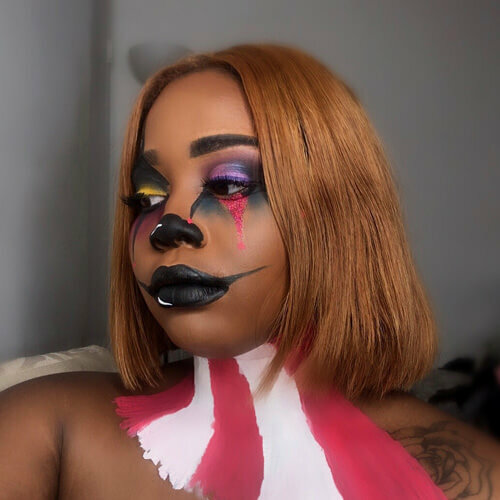 We should understand what Halloween means and how it came to exist before we can buy the best Halloween costumes, play Halloween games or the indulge in Halloween night horrors. This practice gives the celebration meaning, and through such understanding, we will be able to show our respect to the departed saints, martyrs and the faithful. As partakers, thus, it is crucial that we prepare well for the festival so that we can make it memorable as well as give thanks to our brethren who chose to sacrifice for our survival. 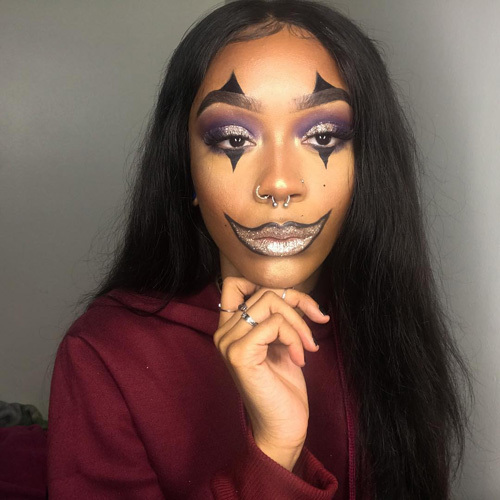 The preparation process involves thinking about the best Halloween costumes, Halloween hairstyles, Halloween foods, Halloween treats and many more physical things to get yourself ready for the event. The Halloween celebration involves a lot of styling to demonstrate the various situation in which our departed champions suffered and how they stayed with their faith intact. 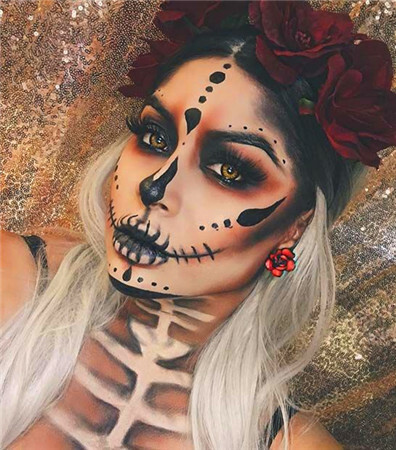 The Halloween party is made colorful with a mixture of styling and lighting, and the collection of hairstyles and makeup make it even lively. 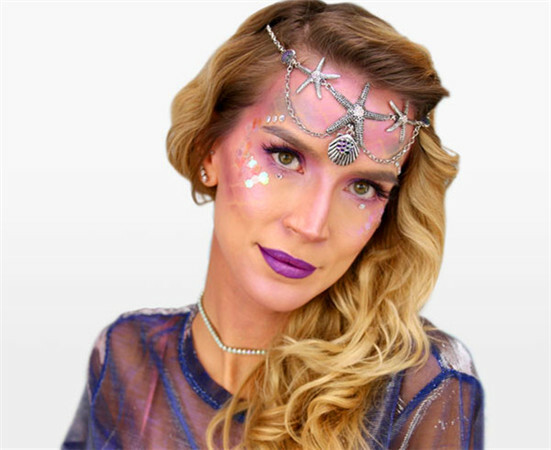 There are several hairstyles and makeup ideas that you may consider in preparation of the festival that is worth trying. The Faux Mohawks hairstyle is what you may choose for your haircut during this year's Halloween festival. The design offers better hair volumes at the top that will match the comb, and your spray will last longer with the style before the scent fades away. 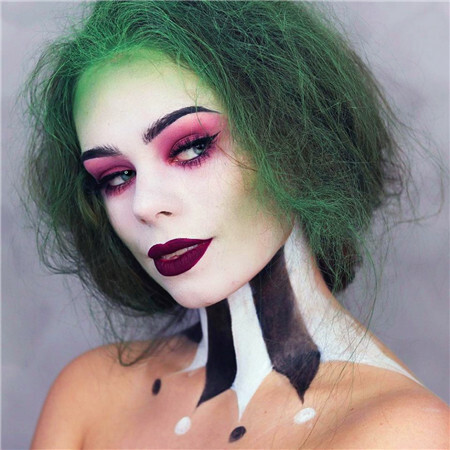 The technique allows for the addition of curls and other modifications that will complement your Halloween costumes. Having colorful hair blended with flowers would make Halloween colorful. The Floral Accents hairstyle is the best you can have for your hair then. With this hairstyle, you can tie your hair at the back of your neck and add different flower patterns to the braid. Achieving this may not be that easy, but the results are worth the patience. Try this hairstyle for this coming Halloween and make your day beautiful. 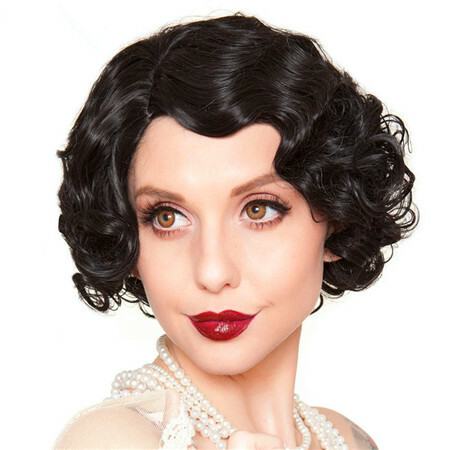 If you want to a simple but stylish design for the coming Halloween festival, then take advantage of the Finger waves hairstyle. 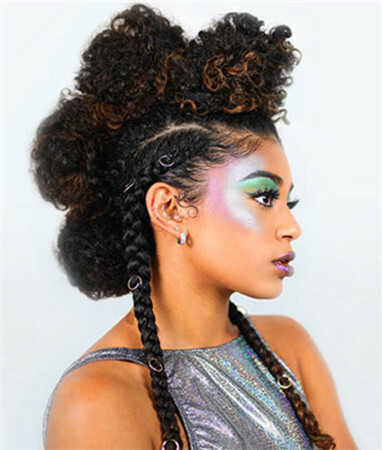 This hairstyle uses falling curls that may go beyond the neck and or form short curls around the head. 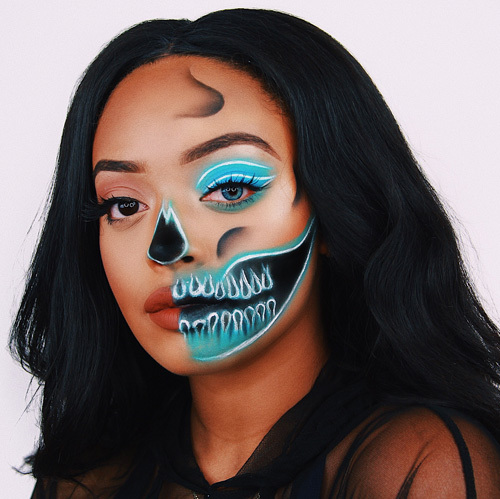 This simple design will get you ready for the Halloween festival without having to do a lot of preparation but still have a beautiful look. The hairstyle matches most of ladies outfit and you will never miss a match. The cat has been symbolic in stylish designs, and you will even find a cat ear effect in your favorite photo editing app. Catwalks have always been used in the display of dressing codes and now why don't you use the cat for your hair too? The designs have proven to be the best for the other fields and your hairstyle it will make you better than that. 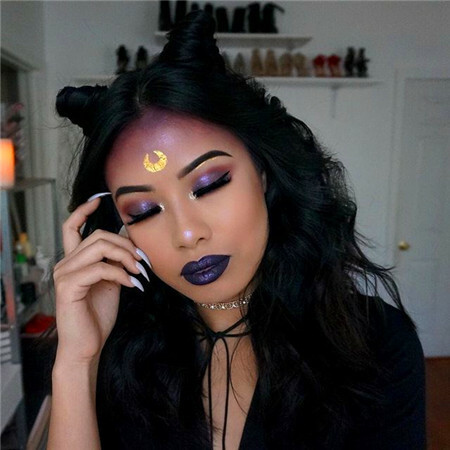 Get the cat look for the Halloween holiday and celebrate it in style-the catwalk style. The simple but elegant hairstyle that will get you prepared for the Halloween festival. Why don't you take advantage of this design and make a beautiful look with simple styling but expensive looks? This event runs for three days which is enough for you to reign with your hairstyle. Have your hair form falling design and that covers your head nicely while providing an excellent outfit for your holiday. Having made your hair, let move downwards towards the face and neck all the way to the abdomen. 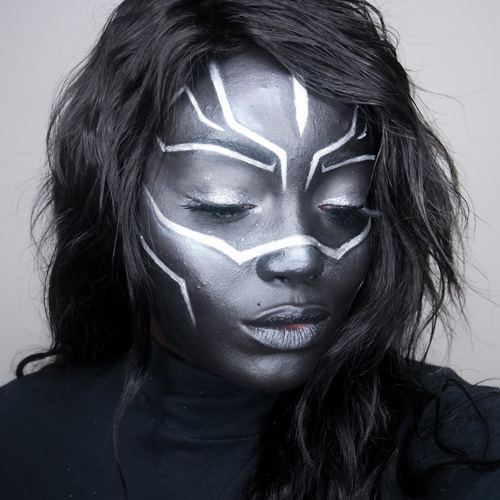 You need to add some effects to the eyelashes, masks, tattoos, jewels, lipsticks and nail accessories. 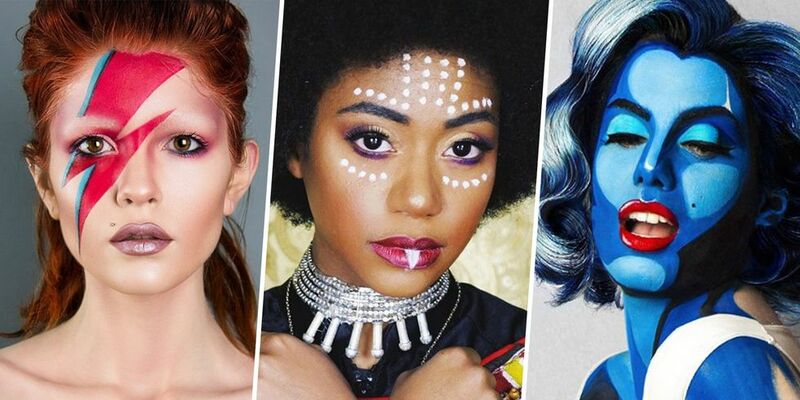 These added styling complements your hair and sets the mood right for the festival. The different types of makeup suit different scenes where action has to be demonstrated on how the Saints went through the hard times. This process may include the use of fake blood to symbolise the flow that occurred during that dark period. Let us see details for some you may consider for the Halloween festival. The various facial costumes that may be adopted for the Halloween night party are the ghost costumes, skeletons costumes, wonder woman or related products. These costumes are intended to keep the holiday spirit high and depict the fear in which the martyrs lived with during the persecution period. Buy yourself one and part-take as one of the setters of the mood of the festival. 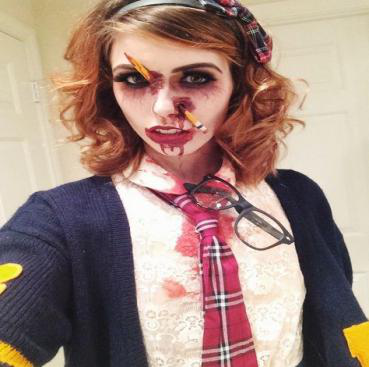 The Zombie Schoolgirl makeup can be the best makeup for your Halloween holiday. 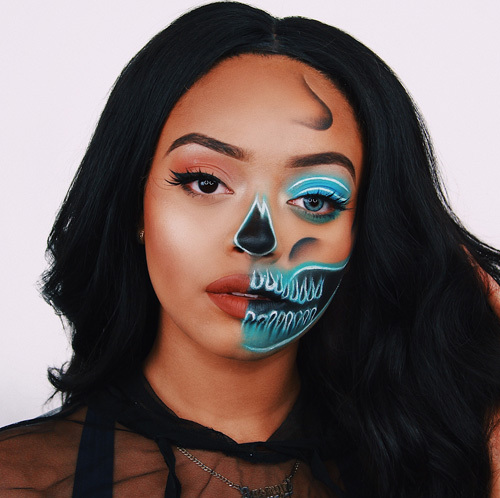 These makeups are scary good and complement your outfit by extending its effects to the rest of the body making you look like a real zombie-the one we see in movies. The collection of various styling form different patterns from which you can select the most appropriate one for yourself. 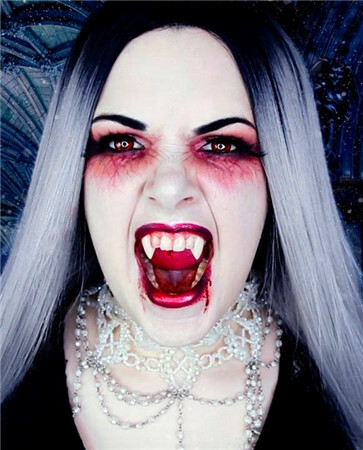 Blend the Halloween spirit with the scary-good looks. The saints and Martyrs went through some torture before they died. The process inflicted pain on them and could have resulted in blood loss. Demonstration of such events requires blood pigmented stains that will be used to show the wounds and blood flow that the departed brethren may have experienced. They may be used in various parts of the body to serve the intended purpose. The makeup is done, and the physical appearance is complete but what do we have to give to our fellow believers and ourselves to that is different from what we always have? The notable events we engage in during the festival which are intended to treat ourselves makes the party pleasant and memorable. Try a recipe that you had never attempted before and made better desserts to make that make the event special than any other event. 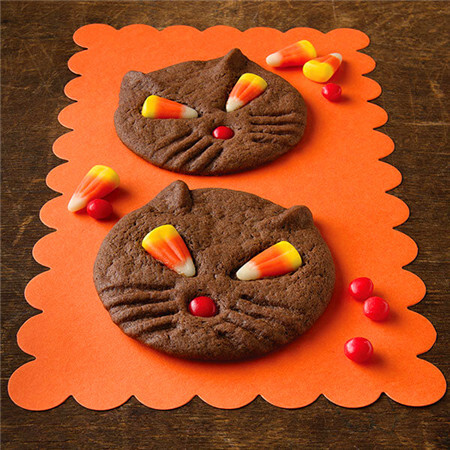 You can try the following treats for the approaching Halloween. Cookies may appear as nothing special until you try the Candy Corn Cookies. Halloween is bringing you this opportunity to try out the cookies and as a form of treating yourself. The cookies are made of refrigerated dough and added white melted chocolate and are shaped to any attractive design you may find appropriate for the event. 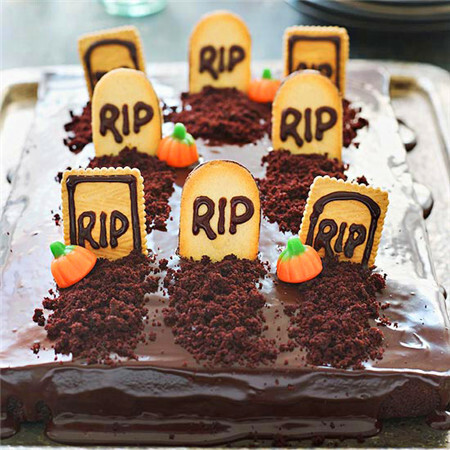 The Grave Intentions are made of chocolate cakes iced with the X and RIP chocolate icing. Chocolate is then added to the resulting cake and skeletons attached to the top to make it look like a grave. This treat is suitable for Halloween because it depicts the scene in which the festival is intended in the commemoration of the fallen saints. 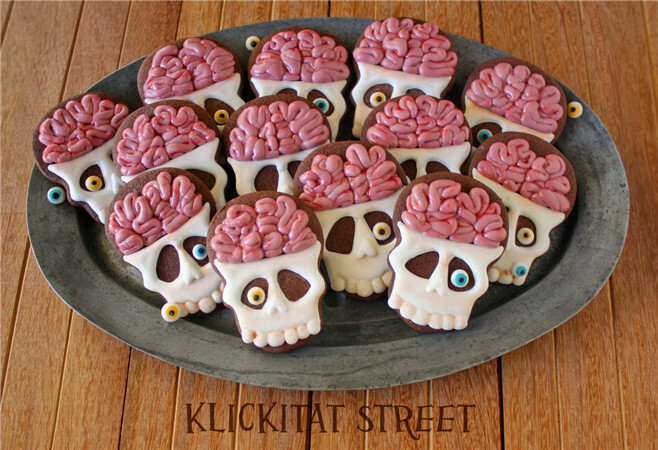 You may consider extending the skull exhibition from the streets to your dining table with the Skull cookies. These cookies are made to look like skulls as the name suggests and they match well the festival as well as serve to treat you well. The cookies are made by baking the wafer into the skull-like cake and then allowing it to cool before spreading vanilla frosting over it. 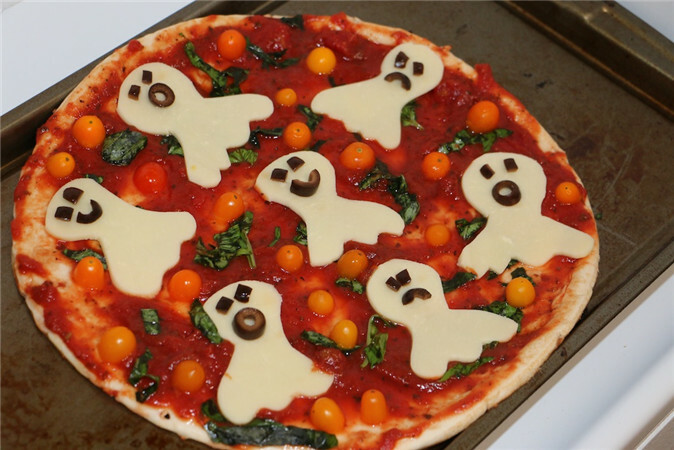 The Ghost pizza is suitable for the Halloween festival because it serves as the decoration as well as feeds us. It is made like the regular pizza but has ghost-like patterns on it which give it the name is called. Send the ghost to your stomach and let the internals feel the spirit of Halloween. 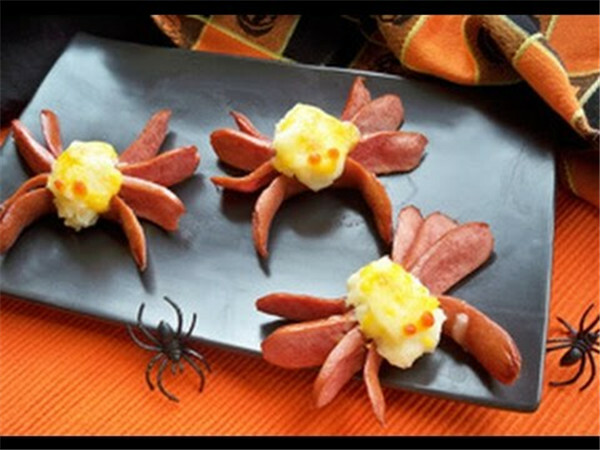 Regular hot dogs cannot set the Halloween mood because we are used to it, and we want to try the spider hot dogs. They are scary but delicious, and this mixture sets the mood right for the festival. This meal is worth trying because of its delicacy, style and the professionalism with which it is cooked. Dracula with its long dentures looks scary. 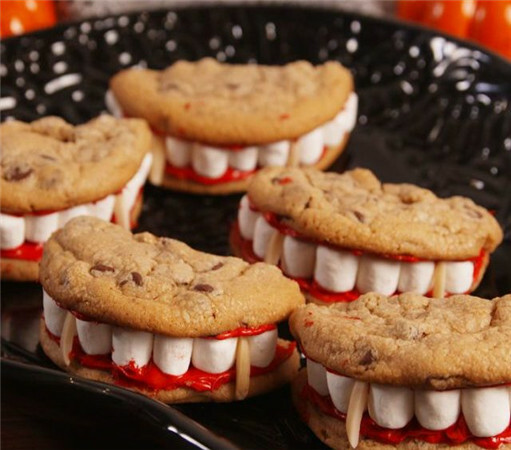 Now bringing the idea to cooing and making the Dracula dentures becomes a good choice of trying a new food this Halloween. Try the Dracula dentures, you may fly during the Halloween party, who knows? They may look scary but they are sweet. The Halloween festival is a special event to us all. Let what we eat, drink and partake in raise the Halloween spirit. Celebrate it with friends, family and everyone. Please use this opportunity to get your partner a Halloween gift or at least give them a Halloween treat to appreciate them for being there for you always. Halloween spirits and ghosts and cats. These are the things I wish for you . . .
Be the spirits of love and kindness sweet. It's a Treat to know you in every way!